From early times, the economic potentials in the North had played a vital role in strengthening Sri Lanka's national economy. Its landscape is unique in character since the nature has endowed it with a rich soil and most fertile paddy lands. Sanskrit, (which means the 'great port'). 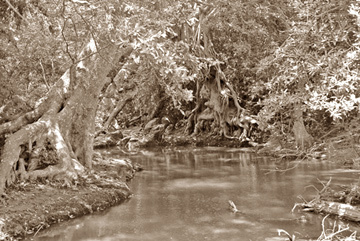 The Malvatu-Oya (Aruvi Aru) provided a direct water route from Mantota to the Ancient capital Anuradhapura. It was the largest and most important port in the Indian Ocean and traders from East Asia and Mediterranean were regular visitors to this great port. Yoda Wewa is situated about 25km southeast of Mannar. The origin of this tank is not known. Some historians believe that it was built by King Dhathusena (459-477) by damming the Malwatu-Oya. Some others believe Nagas of ancient Sri Lanka built it. Mudaliyar C. Rajanayagam in his book, Ancient Jaffna says, "The existence of the extensive ruins at Manthai and of the celebrated Giant's tank close to it., are indubitable signs of an immense population well advanced in agriculture. The giant's tank must, therefore, have been the constructed probable by the ancient Nagas, who were the people then living in the part of Ceylon". The port was surrounded by villages with Naga names. e.g. Nagarkulam, Nagathazhvu and Sirunagarkulam. According to Rajanayagam, a great Naga civilization existed here long before the arrival of Sinhalese. Whoever built the tank - Yoda Wewa is considered one of the earliest and best ever constructed in the world, virtually a pioneer in tank irrigation. Dr. Ananda W.P. Guruge in 'The water lords of ancient Sri Lanka' (UNESCO Courier, Jan, 1985) describes how even the modern European Engineers could not understand the sophisticated systems adapted by our forefathers in the construction of tanks. "Many a modern engineer has been baffled by the sophisticated designs on which these reservoirs and channel systems were constructed. It is known that the Dutch engineers of the eighteenth Century and their British counterparts in the nineteenth failed to understand the design of the giant tank near Mannar on the northwestern coast. Only in recent years, when the tank was restored in conformity with the original design, was it found that leveling by the unknown engineer of the past was vastly superior to that attempted by modern engineers." There were two parallel lines of embankment towards the sea joined by a flat curved bund. This makes the bund to enclose the tank on three sides, making it possible to irrigate the land on both flanks as well as the land in front. British engineers were confused but Brohier saw the thinking behind it. Mannar receives nearly 60 percent of its rainfall during the northeast monsoon, which lasts from mid October through December. Our ancestors would have constructed Yoda Wewa to retain water as much as possible so that it could feed 162 minor tanks dotted round a vast area in the district. It is an unique concept not seen in any other major tank in Sri Lanka. Area being cleared for harvesting. Completing the Yoda Wewa dam. The total capacity of the tank is 31,500 acre feet and the water from this tank is fed to 162 smaller tanks downstream and irrigates about 11,000 hectares of paddy land. At the end of the monsoon season, excess water is stored in a tank upstream (Tekkam Anicut) and used to irrigate an additional 2,500 ha. Yoda Wewa directly benefits 2,500 farm families. For almost three decades parts of this tank was under LTTE terrorists and the maintenance was neglected due to security reasons. 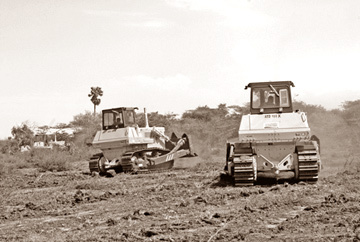 When Sri Lankan Forces liberated the area last year, the restoration of the tank began. Among others, the rehabilitation of paddy lands in Musali, Silavathura, Nochchikulam, Ranketh Wewa and Nochchikotai and the development of the surrounding infrastructure facilities began to progress rapidly. A group of journalists and writers were recently given the opportunity of visiting the vicinity of Yoda Wewa to witness themselves the progress made in the provision of irrigation facilities for the returnees. They were shown how the repair and reconstruction of Yoda Wewa bund is nearing completion and progress made in the clearance of land to be made suitable for cultivation of crops. Ports, Aviation and Irrigation Minister Chamal Rajapaksa also visited the area and met groups of farmers to discuss their problems at site. Later, representatives of Farmer associations met him on a 'Janahamuwa' and discussed the present and future plans for the area. By looking at the activities happening, it is obvious that the Government wants to resettle the war displaced people back in their own lands and in Mannar District, most of them are farmers. Their incomes are based on producing paddy or other agriculture-based products. 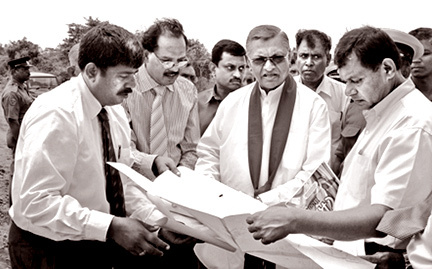 On the instructions of Ports, Aviation and Irrigation Minister Chamal Rajapaksa, a master plan had been drafted to revive the two partly abandoned major irrigation tanks (Yoda Wewa and Akatthinuruppu tank) at a cost of Rs. 635 million. The cost of rehabilitation of Yoda Wewa itself cost Rs. 385 million. It is estimated that 25,000 acres of land could be cultivated benefitting 7,000 farmer families when both tanks are rehabilitated and as soon as the resettlement process begins, sufficient water will be ready for the families who return back to their own lands. It is heartening to note that the Government has fully understood that development of an irrigation system is a crucial element in the social organization and cultural traditions. It not only sustains farmers, but also creates new floral and faunal communities. For instance, the vicinity of Yoda Wewa has also been identified as an IBA (Important Bird Area) by BirdLife International. Large flocks can be found here of both resident and migrant aquatic birds. In Musali, I spoke with few returnees. They were all unanimous in expressing their joy at the change in their fortunes. One farmer said, "In the 1990, 90 percent of the population of Musali was Muslim. That year, the LTTE came and told us to leave the area within 24 hours. We were allowed to take away only our clothes. I went to Puttalam. I had a shop in town and a generator at home. Today, I don't have anything, not even my house. But I am happy to be back. I will work hard and build up my life with my family. What we ask is only water. We are grateful to the Government for what they are doing for us." We also met the Irrigation Engineer, M. H. C. K. Silva. In his administrative area, there are 4,538 acres of irrigable land. He said that 3,000 acres of them could be cultivated in the coming Maha season. His area consists of 23 small tanks which are connected to the Yoda Wewa for water. He also spoke about the resettlement program and said that the Government is giving heavy subsidies to the returnees and also support for their livelihood plans. There is a large increase in the influx of returnees during the past few weeks. 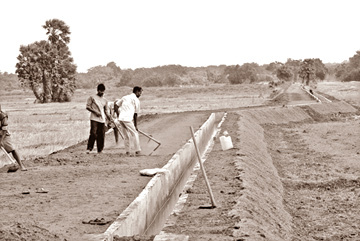 There is no doubt that agriculture - the main economic activity of the people of Mannar District will receive an impetus with the Government's rehabilitation programs in the forthcoming Maha crop season with the North East monsoon expected a few weeks from now. On my way back to Colombo, a few words spoken by a middle-aged returnee reverberated in my mind. "No matter my home is torn down, no matter I have no household furniture or anything tangible, it gives me a different high, and I'm thrilled about coming back to where I belong. We will revive to normalcy in no time." The message he tries to give us is loud and clear.